• Flavor foods with smoked paprika, tamarind, dried lemon or balsamic glazes instead of salt. • Accustom youngsters to eating beans by including them first as a puree in tacos, then in chunkier and chunkier forms as the school year progresses. • Use QR codes on a serving line to provide a quick snapshot of nutritional information on the selections offered. • Show customers how to fill a takeout container with a healthier salad or a balanced lunch. Attendees at the first day of MenuDirections 2012 were presented with those and a slew of other ideas on opening day for promoting health without sacrificing flavor. The practical suggestions came from a variety of sources: from chefs and other expert speakers; from vendors providing samples of their take on health with full flavors; and even from other attendees of the FoodService Director-hosted conference. In a session called Steal This (Healthy) Idea, a take off FSD’s signature Steal This Idea feature, operators shouted out their innovations for promoting health while editor Paul King scribbled them on a flip chart for follow-up in the publication. Those shared ideas ranged from developing an app for providing nutritional information, to labeling the healthier choices at sports-stadium concessions run by college foodservice departments. One participant mentioned that she sells fruit at cost to promote its consumption. Another operator explained that he sends out an e-mail blast called "Healthy Weekly" to highlight what healthful choices will be on the menu for the next week. “We started out with 30 people and now we have 300 who get it,” he said. The session started with King’s rapid-fire delivery of healthy ideas the attendees could steal and implement. He detailed such notions as using green, yellow and red stickers to highlight what foods are healthy, which should be considered so-so healthwise, and which should be eaten with a mind toward moderation. A Massachusetts hospital that took that approach “saw a drop in items that were marked in red. The items that were color coded with green items went up almost 5%,” said King. 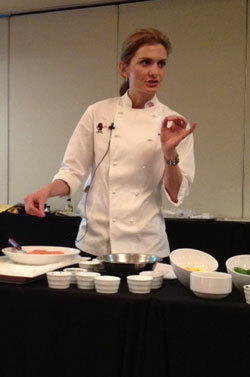 The session wasn’t the only one that offered practical ideas consistent with the conference’s theme, “Creating Flavor, Selling Health.” Chef and registered dietitian Michelle Dudash spoke on “stealth health,” or reducing salt while bolstering flavor. About 40% of consumers monitor their sodium intake, and an even smaller percentage actually avoid selections that are high in salt content, Dudash noted. She suggested that customers want to do the right thing, but taste often trumps health considerations. “Instead of marketing foods as low-sodium or baked, promote the flavor profile,” she advised. She recommended such sodium-lacking flavor boosters as herbs and spices, seasonal ingredients, raisin-juice concentrate, alternative preparation techniques, dried fruits and “pops” of ingredients like sriracha, capers and olives. For instance, she said, bay leaf and thyme can add punch to any soup, and cumin and coriander are particularly good for bean soups. Nutmeg brings out the richness of creamy soups. Basil, cilantro, fennel and parsley can jazz up mashed potatoes. Citrus zest can do it for marinades and baked goods. Dudash demonstrated the effectiveness of the stealth health approach by providing samples of salmon accompanied by a raisin salad. If you’re going to use salt, she advised, opt for flaked or sea salt. She also recommended such “random tricks” as not salting the food until its ready to be served, using vinegar or wielding flavored oils. For more photos from Day 1 of MenuDirections 2012, visit our Facebook page.